Sporting the best record in the Japan Basketball League, the Ryukyu Golden Kings scored another pair of victories this week over the Takamatsu Five Arrows. An overtime 94-86 victory Saturday, coupled with an easier 94-84 win Sunday, pushed the Golden Kings record to 37-11 as the season winds down and eyes are focused on playoffs that begin in early May. Read More! Churaumi Aquarium receives than 10,000 visitors each day, with the bulk of them flocking to see giant whale sharks feeding. The whale sharks, which grow to lengths of 26-30 feet, are a top attraction at Churaumi, Asia’s largest aquarium—and second largest in the world—where its prowess in breeding the giant whale sharks is unmatched. Read More! Okinawa Prefecture Museum’s latest exhibition is anything but dull, as the Jintai Plastomic: Mysteries of the Human Body displays are being described by visitors as “grotesque”, “fascinating” and “creepy”. The Jintai Plastomic: Mysteries of the Human Body exhibition is in the Prefecture Museum’s Art Museum on the 3rd floor, and runs through May 17th. Read More! Japan’s number one metal band, Loudness, will bring its heavy sounds to 7th Heaven in Okinawa City Saturday night. Akira Takasaki, the lead guitarist for Loudness, is performing a solo session 2009 in Okinawa. Read More! One-stop entertainment has taken on a new meaning in Okinawa, as Japanese amusement & bowling center operator Round1 opens a pair of sprawling facilities in Ginowan City and Haebaru Town. Round1 specializes in operating amusement complexes with dozens of different sports, games and relaxation centers. Read More! 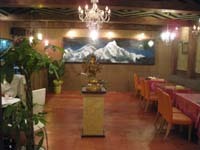 Nepalese curries are now being served in Chatan Town, only a short distance from Camp Foster. Kasthamandap made its debut only several weeks ago, less than two years after owner Narayan Prasad Joshi opened his first Nepalese restaurant in Chatan’s Araha district. Read More!